In 1977 ‘Starlight Dancer’ was released, the only Kayak album with bassplayer Theo de Jong and drummer Charles Louis Schouten. 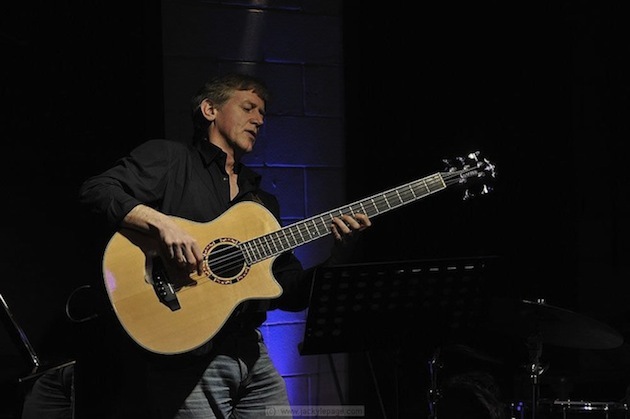 Theo de Jong was born in Utrecht in 1957, in a very musical family. 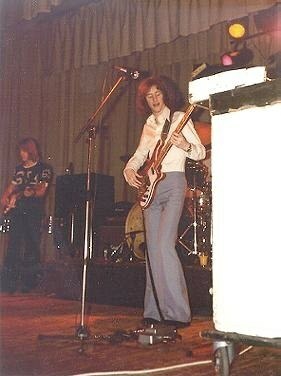 After trying some other instruments, he became interested in the bass guitar. He developed into one Holland’s most ‘wanted’ bassists, playing both pop and jazz/jazzrock. Theo played with many wellknown Dutch bands and artists, like Ekseption, Kaz Lux, Ilse Delange and Trijntje Oosterhuis. But he also performed with big international names like Gino Vannelli and Toots Thielemans. 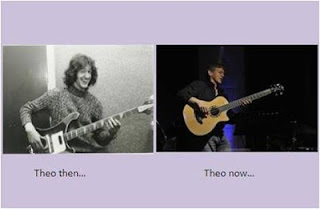 Theo is still a fulltime bassplayer, and he teaches bass guitar and ensemble at two Dutch conservatories. He plays in the band 3 Hands Clapping and in other 'projects'.. In 2001, Theo played in the band of singer Ilse de Lange. 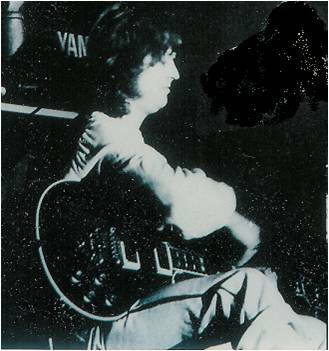 And guess who played guitar in that band? A young Joost Vergoossen! A future Kayak member on stage with an ex-Kayak member! When Pim Koopman left, young Charles Louis Schouten replaced him. Bert Veldkamp left a couple of months later, with Theo de Jong replacing him. 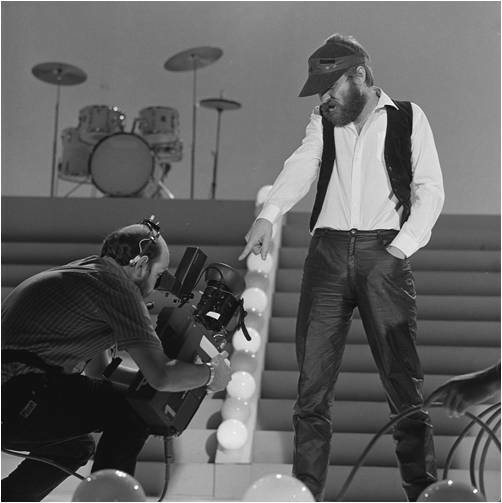 But there was a photo session some time in 1976 after Pim had left, but before Bert left. 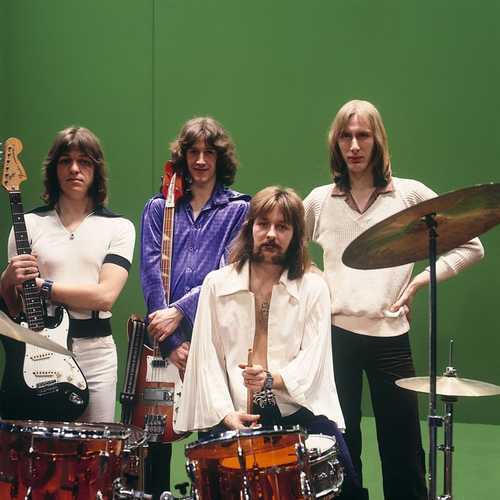 So, the line-up was: Ton, Max, Johan, Bert and Charles. 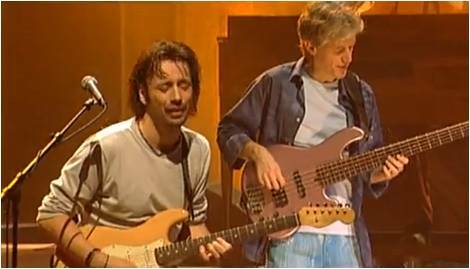 I have absolutely no idea if this line-up ever played live? 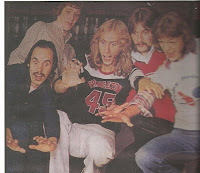 I also found this picture of the 'Starlight Dancer'-band, but without Charles. Had he already left the band by the time this photo was taken? 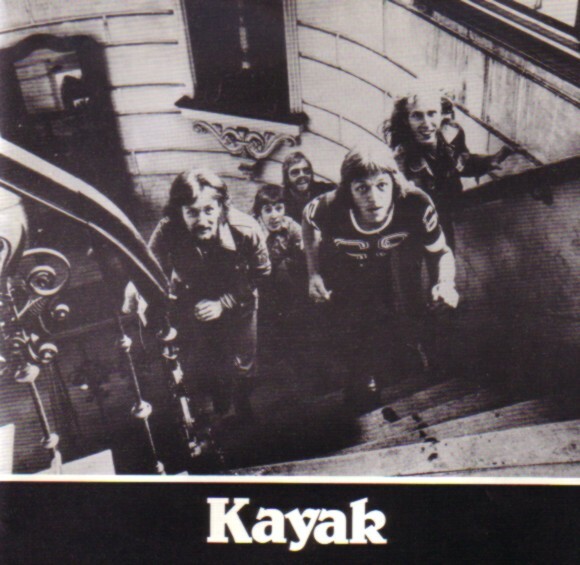 In the Kayak book, I read that the band once mimed 'Want You To Be Mine' for a Dutch TV-show. 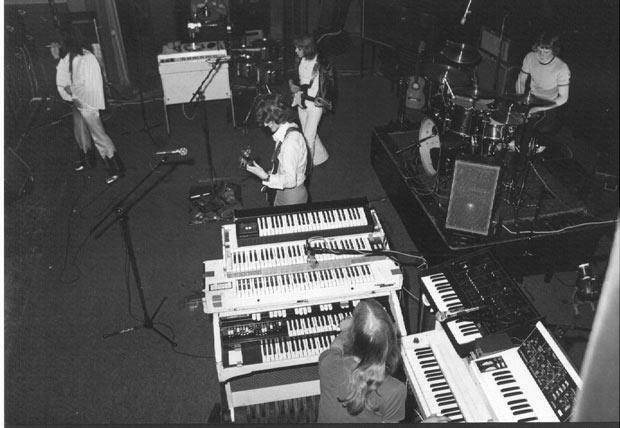 Not in the 'Starlight Dancer' set-up, but already with the 'Phantom...' line-up. But the strangest Kayak appeared in 1982. 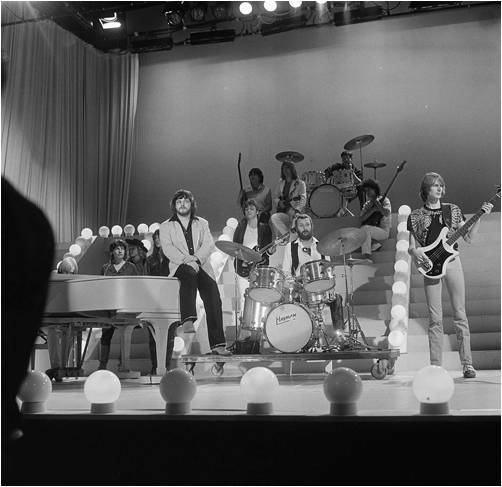 Kayak was no more, but manager Frits Hirschland got an invitation for a promotional visit to Italy, including an appearance on RAI Television.There, they mimed to 'Merlin', with the following people on stage: Ton, Johan, Peter, Irene and Katherine (both of whom had already left the band in 1981) at least were familiar faces. 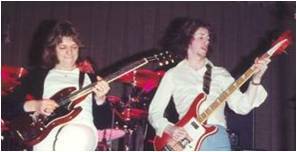 But with Max and Edward gone, they borrowed drummer Ab Tamboer from Earth & Fire, and asked singer John Philippo (from Sfinx) to be Edward for a day. Of course, John later joined Ton and Johan in the band Europe. In 1979, two Kayak members got injured, and both times the misfortune happened in Belgium. The most serious accident happend to Peter Scherpenzeel. 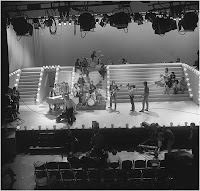 In june, Kayak did a concert for a Belgian TV-show. 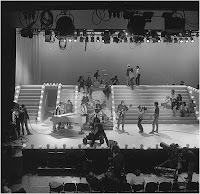 During the opening song 'Sweet Revenge', Peter stepped on an exploding magnesium bomb. He was rushed into hospital with severe burn wounds. 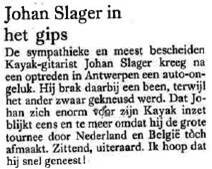 Another, less serious but nonetheless painful accident happened after a show in Antwerp, in may 1979. 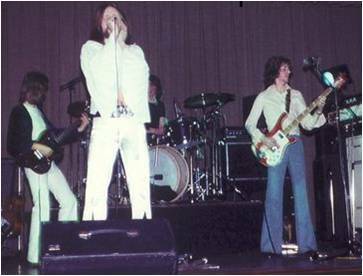 The band had a little too much to drink afterwards, and that lead to a 'car accident', as it was sometimes presented in the press. 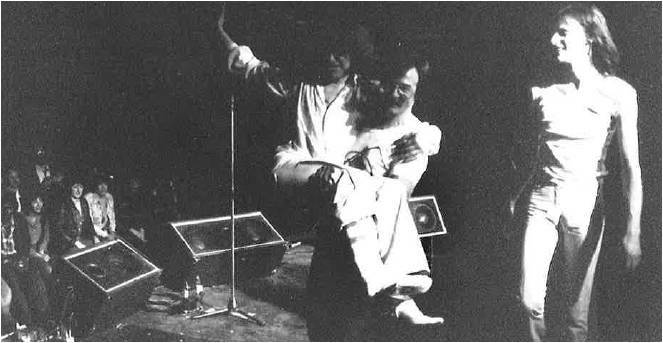 Another story is that Johan was jumping too wild on stage, and that no car was involved. According to the Kayak book, the description 'car accident' was true in a way. What happened was that Johan tried to walk over a parked car, and fell off. Anyway, whatever the cause was, Johan broke his right leg and sprained his left ankle. 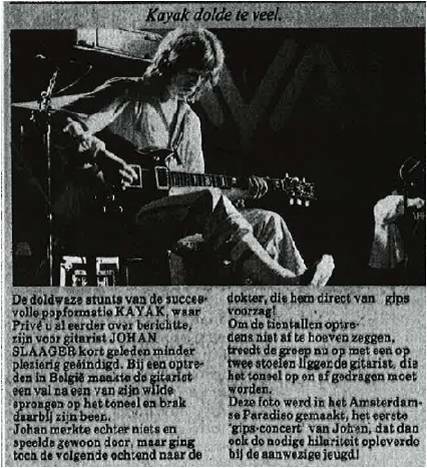 Undeterred, Johan played a couple of concerts sitting on a chair... (Thanks to Frank Lieffering for much of this material!). 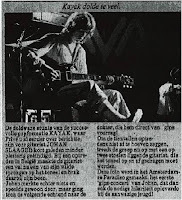 In October 1981, Kayak performed at the 'Golden Harps'-ceremony on Dutch TV. The Golden Harps are important music awards in Holland. In the archives, I see that Kayak played 'Ruthless Queen', and that Max Werner did his solo-hit 'Rain In May' as well. See my Max Werner blog for more pictures of Max doing his solo thing. 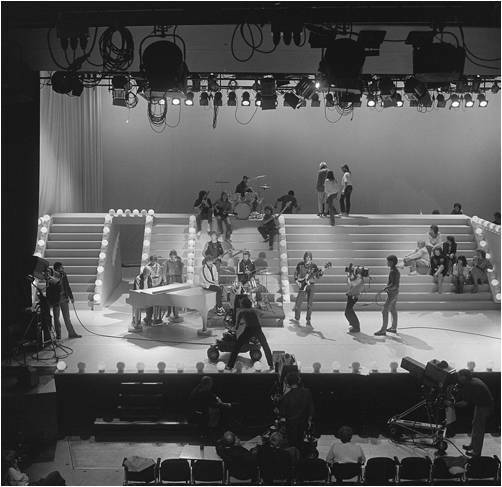 I think these pictures were taken during rehearsals (if not, then the audience was not too big...). 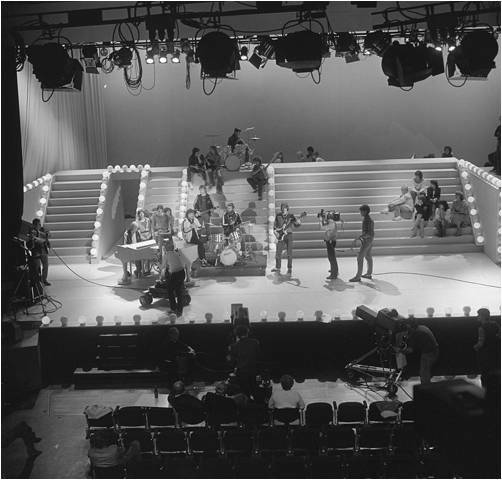 The show featured many Dutch bands and artists, and in the pictures you can see some different artists on stage at the same time. 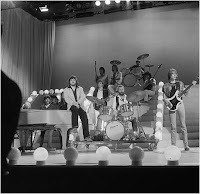 I think the band standing above Kayak, is Diesel (without Pim Koopman, but with Rob Vunderink)? 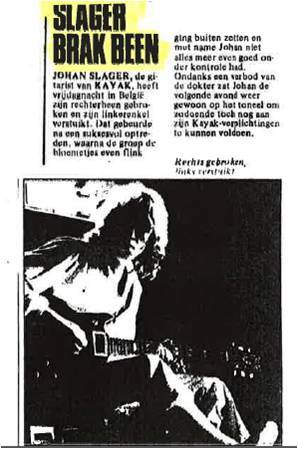 Pictures and stories from the past and present of Holland's best band: KAYAK. Living together with Janneke and my two sons Sybren and Sebastiaan.